It was a great day for the world today, and an even better day for Singapore tourism with special recognition going to the Shangri La Hotel, the St. Regis and the Capella Resort in Singapore. Chairman Kim Jong-un got a good night sleep in the St. Regis Hotel Singapore. This luxury hotel is home to more than 25 shopping malls and department stores, and Kim went out last night to get a feeling of a western lifestyle and shopping options, missing so much in his own country. When news emerged that North Korean leader Kim Jong Un would be staying at the St Regis Hotel, the manager of a nearby Starbucks joint thought the hordes of journalists camped out there would mean good business. While the manager said “plenty” of journalists had patronized the outlet in Tanglin Mall ahead of the Trump-Kim summit on Tuesday, the numbers were not as large as he had expected. However more than 2,500 journalists are in Singapore for the landmark summit. Trump and Kim came together today at the Capella Resort in Retosa. Sentosa is promoted as Asia’s leading leisure destination and Singapore’s premier island resort getaway, located within 15 minutes from the central business and shopping districts. The resort island is managed by Sentosa Development Corporation, which works with various stakeholders to oversee property investments, attractions development, the operation of the various leisure offerings and management of the residential precinct on the island. The Corporation also owns Mount Faber Leisure Group which runs Singapore’s only cable car service. Thrilling slides and encounters with marine life – all in one place on Retosa island. Capella Resort in Retosa is a luxurious island resort known for its colonial façade and contemporary Asian design. 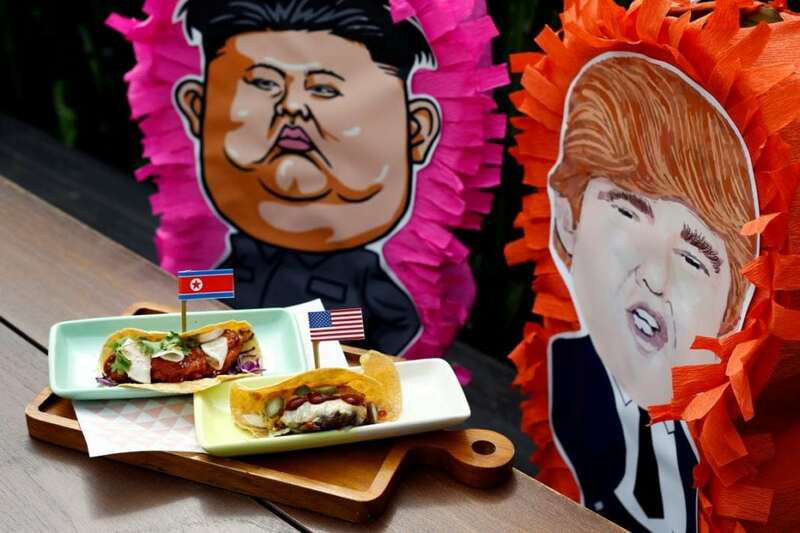 Capella Singapore set the stage today and tone for historic negotiations between North Korean leader Kim Jong Un and U.S. President Donald Trump. London-based architecture firm Foster + Partners repurposed the colonial mansions built for the British armed forces in the 1880s with contemporary Asian design to create a modern, historic resort with a spa, golf course, and chic pools set amid a rainforest on 30 acres of land. The Capella Resort, Singapore is a luxury resort situated in 30 acres of grounds and gardens located on Sentosa Island, Singapore. It has 112 manors, suites and guestrooms designed by Norman Foster. Today’s summit will be historic and with Singapore being the venue tourism to Singapore just received the biggest PR promotion in modern history. The buzz around the Trump-Kim summit on Tuesday has stirred Singaporeans’ entrepreneurial spirit and raised hopes of a tourism dividend long after the summit dust settles. One person is trying to sell his weekend reservations at the Shangri-La Hotel, mentioned in media as the possible lodging of one of the leaders – at three times the price.